We are blessed to have one of the Worlds largest Sturgeon populations right here in Oregon on the Columbia River. It doesn’t matter if you’re embarking on your first sturgeon fishing trip or your hundredth, Oregon has some of the most exciting year-round sturgeon fishing in the country. Sturgeon are migratory, they go out to the ocean to feed and migrate back up the Columbia. We mainly target Sturgeon late may through July at the mouth of the Columbia. This is where the fresh fat ocean fish come to feed on the abundance of anchovies clams and sandshrimp. The majority of this Oversize Sturgeon range from 4 to 8 feet, but it is not uncommon to catch a dinosaur up to 11′. In this area, we are able to fish them in water as shallow as 2 feet deep, often allowing us to see them roll downriver of our bait. The shallow water allows for lighter gear enhancing the fight and feel of these giants. Lewis and Clark Guide Service is Oregon’s leading locally guided and owned sturgeon fishing service. Our guided sturgeon fishing trips operate year round for catch and release while oversize sturgeon fishing charters run between May and July. Sturgeon fishing in Oregon can be performed year round, but oversized Sturgeon fishing only occurs in the summer months. Oregon is known to have some of the best sturgeon fishing in the world. 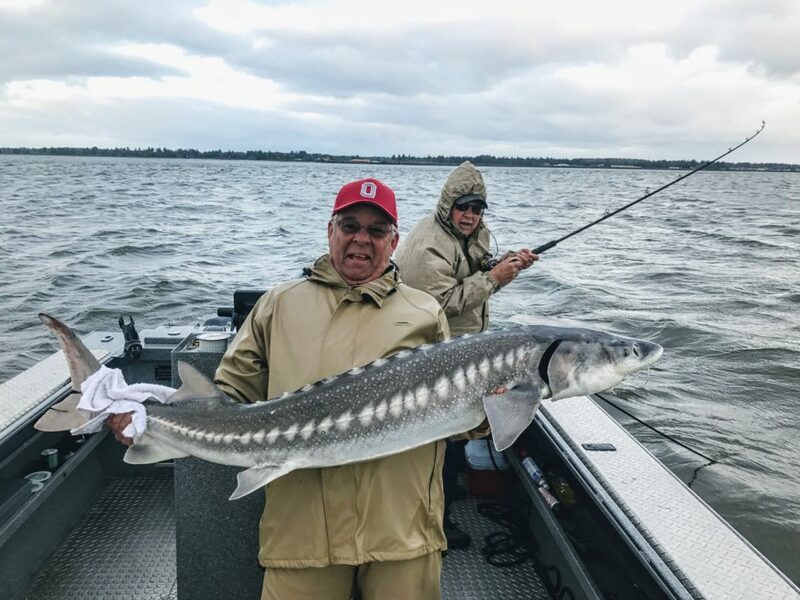 With a brief window for oversize sturgeon, having Jason Lewis as your sturgeon fishing guide is more than just a great time, its your key to an incredible catch. We provide to of the line tackle, reels, and rods from Shimano, and G. Loomis required to bring in the largest sturgeon in the Columbia. Just don’t forget a few important items to bring on your sturgeon fishing trip. We’ll take you to the best sturgeon fishing spots, so when you want to embrace all that Oregon sturgeon fishing has to offer, gaining skills, friends, stories, and some amazing catches call (503) 858-2699 or Contact Us today.